Cinco de Mayo is coming soon, and that calls for some yummy Mexican food! My favorite Mexican recipe is simple and quick to prepare but oh, so delicious. It's good with chips, on fajitas, on quesadillas, on enchiladas, or straight from the spoon. Try it! Here's how to make your own delicious fresh salsa. Using a food processor, chop garlic, onion, and jalapeno very fine, then scrape into a medium-sized bowl. Chop tomatoes as chunky as you like them. (I process the tomatoes a couple at a time, just using the "pulse" button, so that they're pretty chunky.) Add the chopped tomatoes to the bowl. Stir in lime juice and tomato sauce. Chop cilantro and stir into tomato mixture. Add salt and pepper to taste. *Click here for a printable copy of this recipe. Honestly, this is the best salsa recipe I've ever tried. It tastes so fresh. It's good the moment you make it, and it keeps beautifully in the refrigerator or freezer as well. And you can use it to make guacamole! Halve and pit avocados. Place halves in a pie tin and use a potato masher to mash them. Sprinkle with a bit of salt if desired. Stir in fresh salsa. I'm delighted to be joining Barb from The Everyday Home for a Mexican Fiesta Recipe Blog Hop. 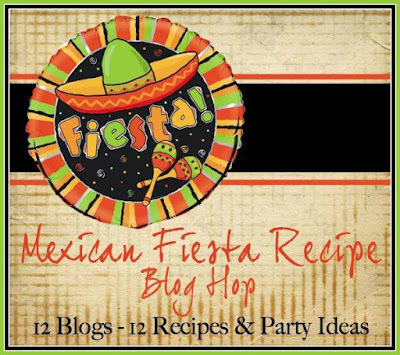 Be sure to check out the end of this post for lots of recipes and party inspiration! Do you have a favorite Mexican recipe? Please share! 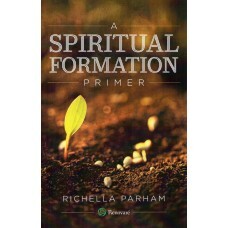 Richella-Thanks for the recipes. I will definitely give them a whirl! Ole! Here in Colorado we eat salsa on everything, I also make my own salsa. But we do not use onions in ours. But I do love onions! I laughed about your friend having to eat avocado sandwiches :) Poor baby! I just want to thank YOU for our kindness of choosing my post entry. After I read what you wrote, I said it really took bravery to make the phone calls and work it all out. But they were so very kind to me. I had so much traffic from your blog this week! I would be so honored if you would consider adding my blog to your blog list. I think I could actually live on salsa and chips. Thanks for the recipes! and I'd like to find something more safe. Do you have any solutions? Yum! In the summer I love to try all kinds of salsa recipes. I'm so glad summer is on its way! This looks delish! My soon to be brother in law makes great salsa but I have never tried myself. Your recipe might change that ! msn. This is a very neatly written article. I will make sure to bookmark it and return to learn more of your helpful info. I love fresh salsa, but have never made it myself. Will be giving it a try. Glad you joined the blog hop! Thanks for the recipe. 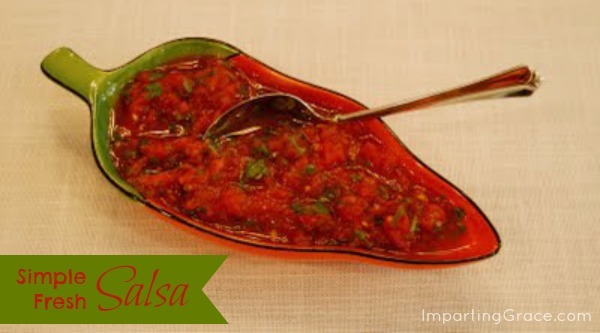 It sounds delicious and we do love a good Salsa.